How to Buy Rail Travel Insurance? When you buy ticket online through IRCTC, you are given an option to avail travel insurance. The insurance premium including taxes is 92 paisa per passenger and is added to the ticket price. However children below 5 years are not covered by this insurance. Also foreigners cannot buy this insurance. Right now the insurance is given free as an incentive to promote digital payments. You can assign the nominee after by clicking on the link given in SMS and mail that you get from the insurance companies. 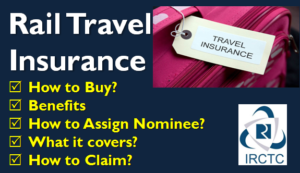 The rail travel insurance covers any accident at the time of travel. This could be accident occurring by any collision between trains, the derailing of the train carrying passengers, or any other kind of train accident. The passenger or their nominee can claim compensation for death, permanent total disability, permanent partial disability and hospitalization charges. Apart from rail mishaps, the coverage would also take care of terrorist attacks and accidental fall of a passenger from a train and normal accidents, riots, robbery and dacoity. The above 3 companies get insurance policies on a rotation basis from an automated system. The insured/nominee has to claim insurance within 4 months from the date of accident. The claims would be settled within 15 days of submission of all documents and paid through NEFT. At the time of settlement the insurance company may ask for KYC documents as per prevalent practices. Also Read: Does Your Life Insurance Offers Tax Benefit? While traveling you must buy train travel insurance as the premium is just 92 paisa for Rs 10 lakh insurance. This would come quite handy in case of any mishappening.